Ideal for Hospitality, Education, health care, casinos, Government and building service. Beats Windsor and Advance comparable models. On-board LED diagnostic module notifies user when filter, bag or brushroll needs servicing. Takes the guesswork out of maintenance. The onboard, LED diagnostic module alerts you when it is time to change dust bag, filter and brush roll. Innovative bag design automatically seals disposable bag opening. Height adjusts manually. 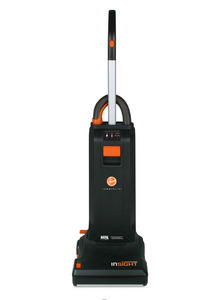 Upright vacuum also features a 10 amp motor; D-shaped, lightweight handle; rubberized wheels; quiet noise level of 69 dBa and onboard tools and quick-grip extension wand. Vacuum requires no tools for assembly.